MeMo was designed to respond to the needs of patients with cognitive impairment, of healthcare professionals working on the prevention of cognitive decline, cognitive training and stimulation, as well as of any person willing to train his/her memory and concentration. MeMo is the expansion of the work the Innovation Alzheimer association, CoBTeK University of Nice Sophia Antipolis research team working directly with patients from the Nice memory Center, as it provides them with additional ICT-based materials to stimulate and train memory, attention, executive functions, language and gnosis. MeMo can indeed be employed by clinicians with their patients in individual or group sessions and by the patients alone at home, as a continuation of the work done with the therapist. 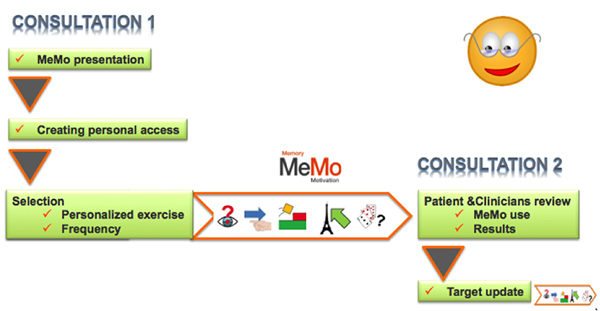 Till July 2015, MeMo games were regularly proposed to the patients at the Nice Memory Center. MeMo is freely available on the internet, and can be used on any pc/laptop or tablet. The exercises are designed and developed by neuropsychologists, medical doctors, researchers and engineers. Every exercise was conceived to train a specific cognitive function, to allow a personalized training based on the observed deficit. MeMo also allows keeping track of the evolution of performance overtime. After creating an account, the user can track the evolution of his/her performance in the exercises, which can boost motivation and valorize the efforts. This also allows the therapist to follow the evolution of patient’s performance over time. Our aim is to adapt MeMo and its exercises to the users, by seeking an optimal ease of use. Our team is working continuously to add new games, fix problems and make improvements to the website and the exercises.